Lokesh, the Tibetan monk, embodiment of Avalokiteshvara and conscience in Eliot Pattison’s Tibetan detective series, says to anti-hero Shan: “Jamyang told us his story…It is but for us to understand it. He left us the sutra of his life. We simply need to learn how to read it.” One of the most compelling detective series with a strongly Buddhist and pro-Tibetan message, Mandarin Gate(1) is the latest in the life of Chinese detective Shan and his eternal battle to fight wrongs with right. Jamyang is one of the characters in the novel but with Lokesh’s pronouncement, he can be any one of us. 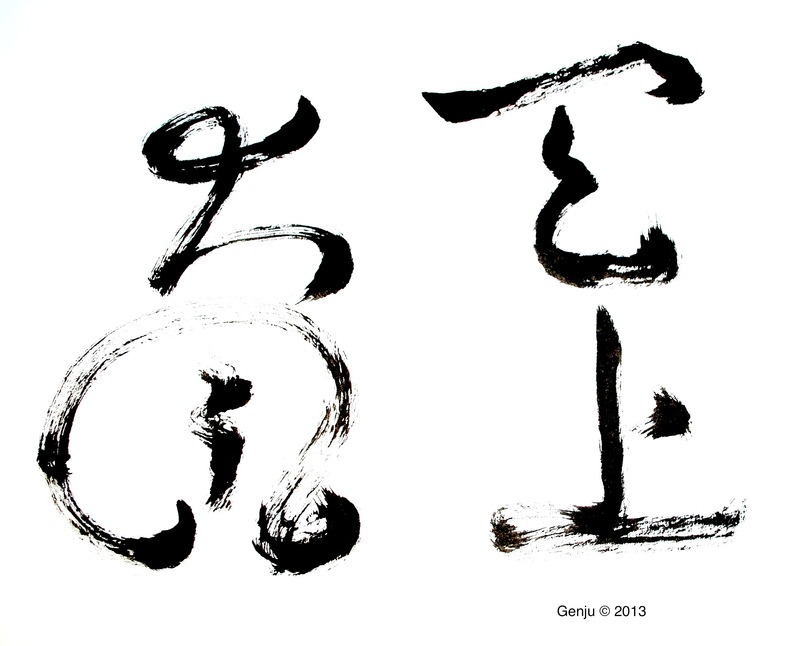 How do we write the sutra of our life? How do we read and understand such a sutra? Sutras are complicated things, filled with mysterious allusions and verbal illusions. Recently, I had the absolute joy of being part of an art show with Kaz Tanahashi. Over a quiet lunch together (a snow squall had kept others stranded in their homes), I asked how best to study Dogen whom I said, “Is complicated though seemingly simple.” He chuckled and nodded: Dogen is in opposites. He writes “self” but he means “Self.” If you don’t know opposites, you cannot know Dogen. I wish I could say that helped. It did in a reassuring way that one suddenly realizes the mountain is confirming it is a rather large and ofttimes impenetrable mountain which requires a good guide or key to its mystery. And it leaves me wondering what are the keys to these impenetrable lines of mysterious symbols and signs I’ve carved into my life. My spiritual life – though I hesitate to call it that any more, being saturated by the demands of the mundane world. Then again, that is what it is in its truest form be it Zen or any other form. Chogyam Trungpa wrote in The Myth of Freedom(2) that the intent of the discipline of practice (sit, cook, eat) is to go deeper into an intimate relationship with boredom. That is, we drop past the labels, preferences, gold stars (he calls them ‘credentials’) and addictions to form. We enter the naked lines of our scriptured life. We become entirely what we are in each moment, mountain, river, cloud, sky. Our problem is that we tire of this ‘just is’ and want some reassurance we are on the right track. The unspoken demand is that this will be value-added to our life, our personality, our internal sense of worth. It will be a ‘credential,’ what Linchi called a ‘rank.’ I understand that it is hard to keep plugging along without some reinforcement. Truthfully the dishes wouldn’t get done without that promise of dessert after. And this is the key to understanding the sutra of our life: we make it all contingent on something happening for us (not in us). Wait. What was that story? Gutei’s finger in the Mumokan! Gutei answered questions by raising his finger. His attendant started copying him and Gutei, seeing his mischief cut off the attendant’s finger. As the boy ran away crying, Gutei called to him and raised his finger. The attendant attained enlightenment! Boom! See, we take the raised finger as propellant to full realization and run around flipping it out. Instead of appreciating the simplicity of the one-fingered teaching, we elevate it and ritualize it. While this subtext of rigidly copying our teachers calls for compassion for our limitations, the ultimate intent of practice is in learning to write our own sutra, penetrating our own mind. To fully study our self as Dogen teaches, we need to uncover our tendencies to get caught in various levels of mind. In the Book of Chuang Tzu (Zhuang Zi)(4), Confucius (the mouthpiece for Zhuang Zi) is guiding his pupil Yen Hui who is taking on an immense task of transforming a nearby king’s evil ways. Yen Hui had come up with various strategies all of which involved force and intimidation, most based on literal interpretations of Confucius and in his own pride. The master tries in many ways to exhort Yen Hui to see that forcing others to be benevolent is not the best approach. Finally, Confucius tells Yen Hui he has to fast. 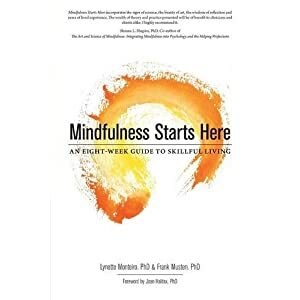 Yen Hui is baffled because he does fast and Confucius tells him it is the fasting of the heart/mind that is necessary. Your mind must become one, do not try to understand with your ears but with your heart. Indeed, not with your heart but with your soul. Listening blocks the ears, set your heart on what is right but let your soul be open to receive in true sincerity, The Way is found in emptiness. Emptiness is fasting of the heart. Hearing stops the ears (it’s at the level of doctrine). Mind stops with signs (it’s a process of matching up names to reality). 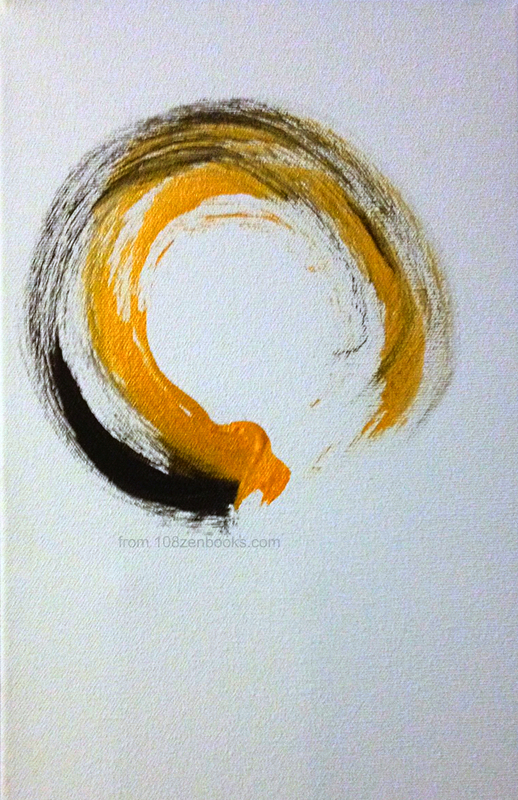 Qi is empty/tenuous and opens to things themselves. We get caught at the ears (think sound of tree falling); we chant and are caught in mind, mapping to reality. It is only when we cut through these iron-hard nails that hold together our doctrines and assumptions that the sutra of our life can be understood and then written in clear, unimpeded language. That means willing to be vulnerable in our ignorance, exhausted by our anger, and bruised hopelessly by our attachments. With no desire or hope of reward. So write your sutra without the traps of facts and figures, without the compulsion to line up philosophies with actions. Rather write with a boundless transparency and simplicity of what you eternally are becoming. Some time ago, one of my dharma friends sent me this lovely book. 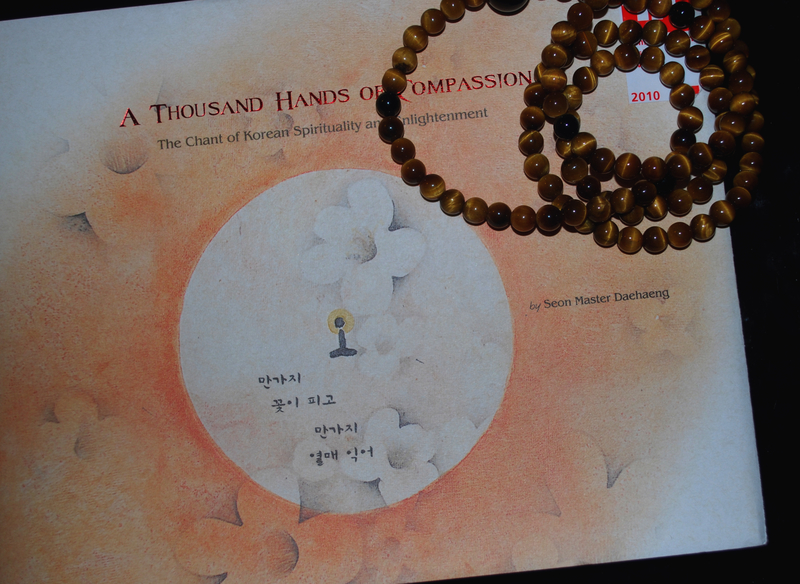 A Thousand Hands of Compassion: The Chant of Korean Spirituality and Enlightenment by Seon Master Daehaeng¹. I was strangely moved. Strangely because I have never really believed that people who haven’t met face to face actually have the capacity to activate a resonance that one might call a bond, a quiet joy, a sense of being considered kindly. More strangely because I thought I’d done enough work on my own walls and thickets, been the recipient of enough gifts from people I’ve not yet met and those I may never meet to have these walls become porous enough for kindness to flow in. But there you have it. I am one gnarly, snarly nut to riddle with holes. Kindness is an interesting thing. It’s one of those behaviourally-based activities that is only known when seen. I do find it easy to be kind. Ultimately it doesn’t cost anything and there is a feel-good factor when all is said and given. Compassion, however, is something else all together. It costs everything. And it requires that we are willing to be in the presence of everything. There are no options or substitutions allowed. My one mind is the root of all things. so all things I completely entrust to it. This book is an amazing opportunity to practice just that fortitude. 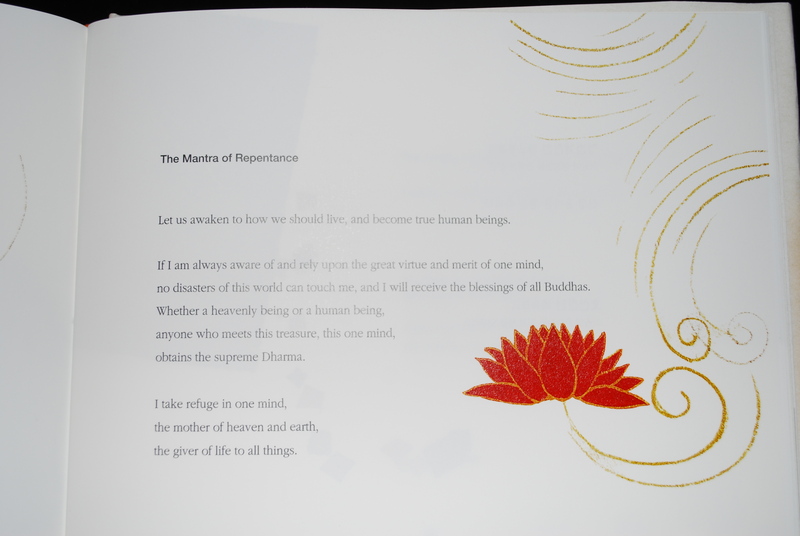 Taken from different sutras, it is compiled as a single text and chanted daily in Korean temples. The verses call on us to devote ourselves to that one mind that is the mind of all Buddhas. Some read as short recitations that almost evoke a full prostration. Others are slightly longer tracts that evoke an inner call-and-response. 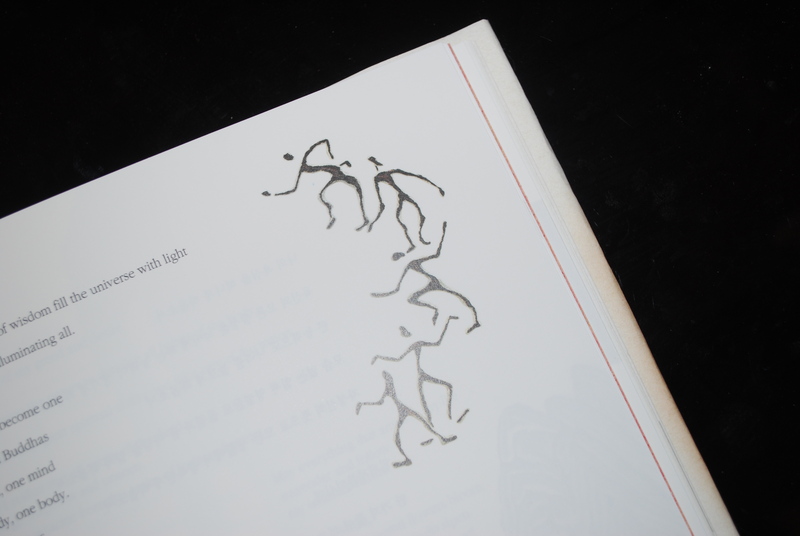 Each page carries a verse, Korean on one side, English on the other, and is enriched by the stunning art of Hyo Rim. The minds of all Buddhas are my mind. Tomorrow Frank and I leave for our respective retreats. He’s off to something somewhere that hopefully won’t have him terrorizing other meditators with his death stare. I’m off to learn a bit about self-compassion. It seems an oxymoron this term “self-compassion” but I do recall spending about two years on the first two lines of the Metta Sutta. So I’m taking this book and my mala beads and an appreciation for T.S. Eliot. ¹You can read more about Seon Master Daehaeng here. I can’t find the source of the quote attributed to Dogen, who apparently said it to the Third Patriarch of Eihei-ji. Upon the arrival of our Gr’Kid, a dharma sister sent me the quote welcoming me into the the community of Grandmothers. Robai-shin, wrote another. It will bring you deeper into the heart of compassion. Dogen wrote in Instructions for the Tenzo that “in performing our duties along with other officers and staff, (we) should maintain joyful mind, kind mind, and great mind.” Joyful mind arises from our gratitude for being born into this human form. More so that “we have the good fortune of cooking meals to be offered to the three treasures.” Now that I immediately understand because cooking is the heart of my family, its compassionate ground, and the source of all healing. The curries, dahls, rice. The desserts of glutinous black rice and agar jellies. The pungent fermented tea leaves and pickled ginger digestives. Dogen’s exhortations in the earlier sections of Instructions read like a day in my own grandmother’s hotel on Sule Pagoda Road in Rangoon. Well, maybe it was a bit more frenetic than Eihei-ji because my uncle and aunt who helped there were just as likely to swing cleavers at each other as at the chickens. My mother, despite not knowing how to cook (why would you need to when your own mother owned a hotel and simply delivered the food each day! ), developed her own skills ultimately crafting a pilau rice that earned the title “Gamma’s Rice.” And, the deterioration in its edibility was what first raised the alarms of her encroaching dementia. I’m not sure what dishes will identify my place on this earth but that is the nature of being parent – and now grandparent. I delight in an eclectic range of textures and flavours, only coming into the ancestral recipes later in life. Interesting how I can now say “later” although it’s never been an avoided or hidden idea that aging grants me many somewhat unearned privileges. My own curries are finally edible and I turn more towards the Indian styles of cooking and taste. And yet, my signature dishes tend to be Burmese, likely more for their rarity than their actual craft. Robai-shin. Grandmother-mind. Kind mind. The second of Dogen’s doors to community is that quality of kindness. Not just kindness but a stance of protectiveness of the present for the future. 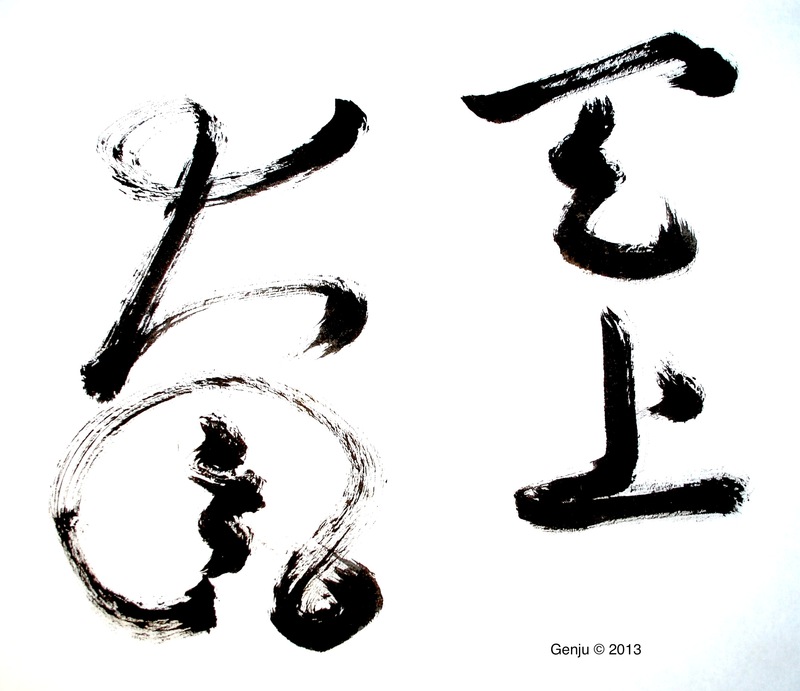 Kaz Tanahashi¹ translates it as a parental mind. We develop this kindness for our children to the extent that we “do not care whether (we ourselves) are poor or rich; (our) only concern is that (our) children will grow up.” In principle, it is our only concern: that they survive. Of course, we harbour hopes that they will live carefully, in good health, making wise choices, respecting others as themselves, and knowing that the bloodline extends through them but doesn’t end there. The tricky part is that our kindness is offered against this backdrop of hope but cannot be directed by it. Robai-shin is an offering “without expecting any result or gain.” It simply unfolds as that hand reaching for the pillow in the night, the bow that evidences transmission beyond words, the sound of the single hand at death. It holds, it honours, it transcends form as it is called to do so. Both my grandmothers were iconoclasts in their own right. My paternal grandmother was a rather severe character but with a sharp sense of humour particularly about her love of oversized cheroots. Devoutly Buddhist, she was the quintessential pragmatist. She never cooked, cleaned, or otherwise engaged in tasks that someone else in her life was already doing. I saw her weekly but never among family. She arrived each Sunday to take me to the Botataung Pagoda (while my parents entertained their friends at poker and various gambling games). I don’t recall any words of wisdom or special gifts. That is, until one day I overheard an intense argument she was having with my father over the damage he was doing karmically by exposing me to his high society lifestyle. She was formidable and, as I understand from the family myths, would not have been above picking up a wooden shoe to whack sense into him at any age – his or hers. I never knew her name until I was an adult but it didn’t dim the connection. My maternal grandmother ran the Piccadilly Hotel in Rangoon. Now she, along with her only surviving son, was all about food. I lived in the hotel with my five male cousins and we all became little cook’s helpers. Unfortunately, only I escaped the epigenetic change that enabled the boys to become great cooks. As “Ma,” she made sure we roamed the hallways as a little gang, thereby protecting us from certain characters who lodged there in transit to Bangkok or Delhi. She set the rules for riding out into the Night Bazaar on my uncle’s scooter, clutched to his flapping, open shirt. Being the only girl (at the time), I was forbidden to go though my uncle found ways around that senseless rule. Apparently robai-shin meant something different to him. As “Belle,” she swept through the evening society parties in shimmering gowns with a hairstyle of braids wound upright over her head like a dark halo and an eternal eye cast on negotiating the family’s best future. Out of joyful mind and robai-shin arises great mind. “Like a great mountain or a great ocean,” it is the nondiscriminatory mind. It is the vast, boundless space which is also robai-shin and joyful mind because it contains everything. Instructions for the Tenzo is a simile wrapped around a metaphor at whose heart lies a mirror. It’s a discourse on how to wash rice, pointing to principles for living a life of deep practice, penetrating that deep question of who we truly are. In the teachings of the three minds, Dogen reveals the components of both community and the Great Matter, leaving it up to us to craft a recipe that honours why we have been held in robai-shin and are called to embody robai-shin. 1. Tanahashi, Kazuaki (Ed. ), Moon in a Dewdrop: Writings of Zen Master Dogen. North Point Press, NY.